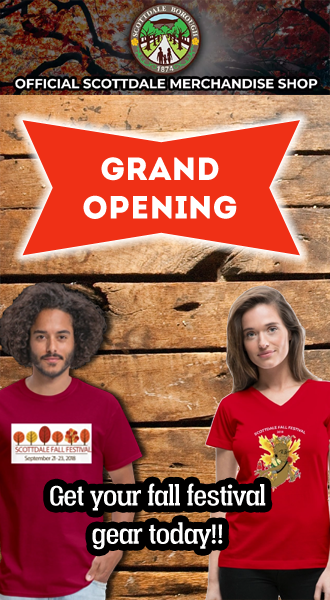 In 2014, the Scottdale Fall Festival celebrated our 40th anniversary. 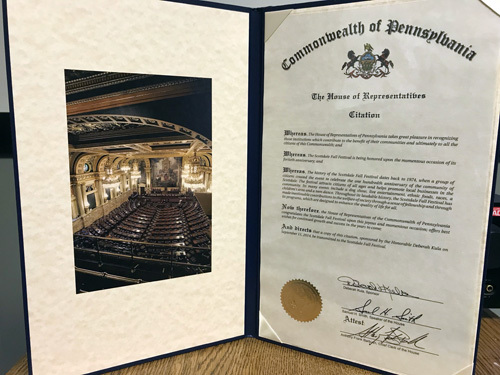 The festival was recognized by the Commonwealth of Pennsylvania’s House of Representatives with the citation shown above. The Scottdale Fall Festival has always been a festival for the community of Scottdale. The festival started with a group of Scottdale citizens who created a celebration for the 100th year anniversary of Scottdale. This group of people then decided to have an annual festival called the Scottdale Coke Heritage. This festival was started in 1974. The festival would change names several times over the years until its present day name, The Scottdale Fall Festival. This is one of many events that the citizens of Scottdale can be proud of. This festival was created by the community of Scottdale; for the community of Scottdale. Through the years the festival has attracted people of all ages and helps promote local businesses in our community. This three day celebration has many events such as a dog show, live entertainment, race, ethnic foods, children’s area, and much more. The Scottdale Fall Festival committee looks forward to seeing you at the next festival!